Director Adam McKay is typically associated with uproarious absurd comedies like ANCHORMAN: THE LEGEND OF RON BURGUNDY, STEP BROTHERS and TALLADEGA NIGHTS: THE BALLAD OF RICKY BOBBY. 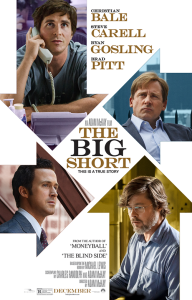 THE OTHER GUYS combined comedic farce with socio-political commentary, but it’s not until now with THE BIG SHORT where McKay successfully hits his stride, blending real-world dramatics with a sharp comedic tinge. It’s sly, intelligent, wickedly witty and should be fundamental viewing for the American public. It’s hard to throw a rock and not hit someone who’s been affected by the fallout from the financial crisis of 2007/ 2008. It’s the new cancer. Back in 2005, however, banks were riding high on offering sub-prime mortgages and the public, wanting to live out the American Dream, bought into the bad faith deals. This is the story of how coincidence met opportunity for a group of “outsiders and weirdos” – including socially awkward Dr. Michael Burry (Christian Bale), acerbic Jared Vennett (Baby Goose Ryan Gosling) boorish Mark Baum (Steve Carell) and his team of dedicated workers (Hamish Linklater, Rafe Spall, Jeremy Strong), Brownstone partners Charlie Geller (John Magaro) and Jamie Shipley (Finn Wittrock) and their paranoid pal Ben Rickert (Brad Pitt). They all saw what was coming and had a brilliant, albeit insane, idea. They would short, or bet against, a behemoth institution – the banks. Their bold move leads them down a rabbit hole of discoveries where their inquiries uncover frightening truths. McKay infuses the picture with an undeniable crackling energy, building intensity to an exhilarating cinematic scale. It’s also totally different in feel compared to director Ramin Bahrani‘s 99 HOMES. His documentary style, utilizing camera pans and zooms (a la MODERN FAMILY minus the testimonials), augments the immediacy and resonance of the narrative. Witticisms from Mark Twain, Murakami and a random guy at a D.C. bar also appear during the act breaks, hammering home the points each is about to make. There are times when it feels like you’ll need an MBA to decipher what’s being said, but don’t worry. When business-speak gets too heavy, McKay peppers in ludicrously hilarious celebrity cameos, explaining sub-prime mortgages from a bubble bath and synthetic CDO’s from a blackjack table. Cards occasionally pop up on screen to define things (like ISDAs). It’s good the filmmakers teach you what these things are – and do so in memorable fashion. 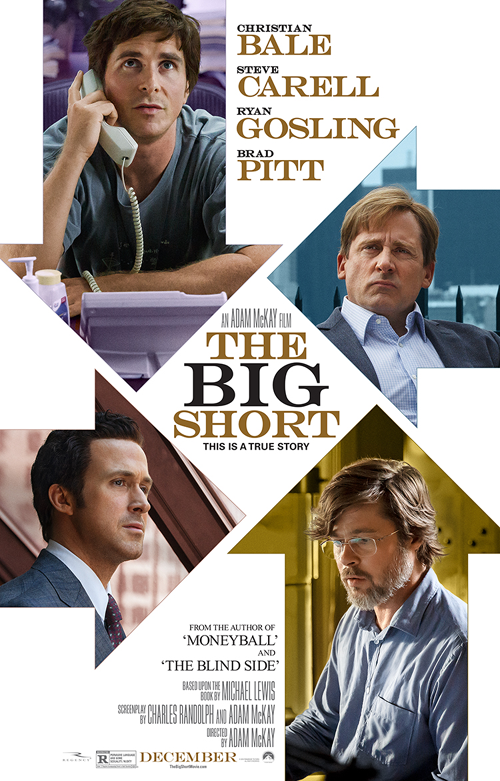 McKay and Charles Randolph’s script (based on Michael Lewis’ novel The Big Short: Inside The Doomsday Machine) draws its characters well, rendering them as three-dimensional, fully fleshed-out humans instead of caricatures. It would be easy for a cast this big to get lost, but McKay finds the perfect balance with their intersecting arcs. Bale embodies his character’s steadfast tenacity like a second skin. Carell gives a career-defining performance filled with pathos, vulnerability and humor. It’s also fun to see him play against Gosling again (hooray CRAZY STUPID LOVE reunion!). There’s a delight in seeing Gosling break the fourth wall, crushing his role like a cross between Ferris Bueller and THE WOLF OF WALL STREET’s Jordan Belfort. It would be easy to make light of this serious situation, but McKay strikes the right tone in mocking and exposing the insanity that got our country into this mess. This may not be exactly an uplifting, “feel-good” film, what with the systematic deception from the banks and government and their continued back-scratching and glad-handing. Nevertheless, it does educate – and best of all, it does so under the clever guise of entertainment. 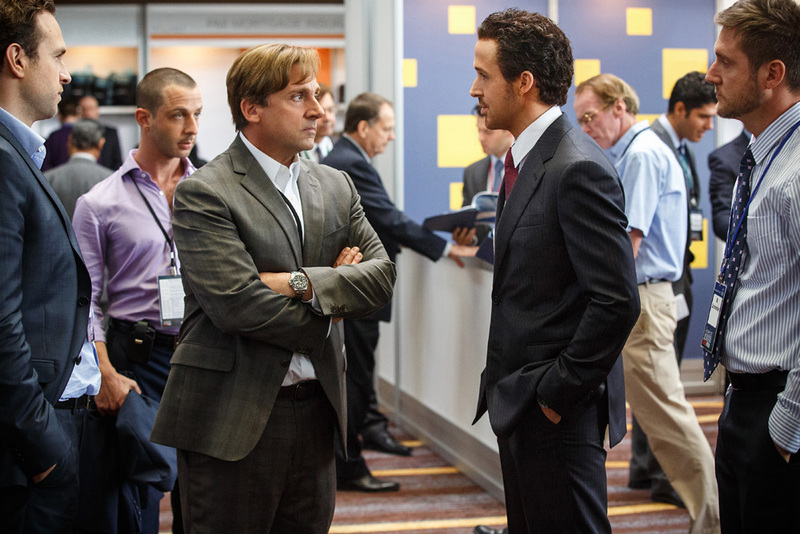 THE BIG SHORT played AFI Fest on November 12. It opens in limited release on December 11 and wide on December 23.